I’m sharing some of my Favorite Things of 2015…and I’m giving away a complete set too! I’m so excited to bring you today’s amazing giveaway – it’s actually 10 Giveaways – with a chance to win over $3,000 in prizes! I teamed up with 9 of my favorite bloggers to bring you our favorite must-have gifts this year, and we are giving away our own dream gift packages! That’s 10 chances to win some of the most amazing kitchen gadgets, gift cards, gourmet foods, and amazing goodies! 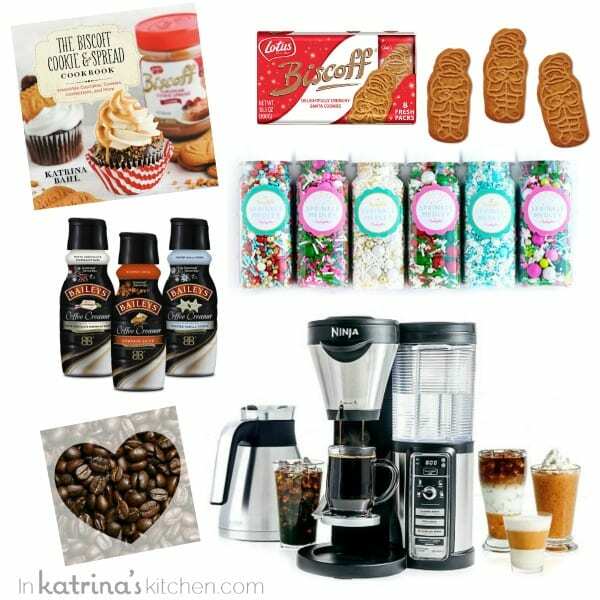 But first let me tell you about the COFFEE AND COOKIES GIFT SET I’m so excited to be giving away! The star of the show is my favorite coffee brewer of 2015- the Ninja Coffee Bar. This baby retails at $179.99 and it will replace every brewer on your countertop! With the touch of a button you can make every kind of brew your little heart desires. I had the privilege of trying the Ninja Coffee Bar a few weeks ago and I couldn’t wait to get one for my own home. I know you’re going to love it! The Ninja Coffee Bar™ with Auto-iQ™ One-Touch Intelligence allows to you brew 1 cup, a travel mug, half carafe, or full carafe. I love the Specialty Brew button that makes an espresso style extract so I can make my favorite lattes, cappuccinos, and iced coffees at home. You can purchase the Ninja Coffee Bar on Amazon and at most major retailers. My friend Aimee is giving one away at Shugary Sweets too so be sure to pop over! You know that my love of coffee runs deep. I’m also including a bag of my favorite local coffee from American Serenade. This one is called Snickerdoodle, but you can choose your flavor. I’ll also be including 2 vouchers for my favorite Bailey’s creamers. Basically I like my coffee to match the color of my skin. And I’m from northern Ohio so….. yeah. I like good coffee and sweet cream! I’m OBSESSED with this Holiday Dreams Variety Pack of sprinkles from my friend Rosie at Sweetapolita. I love everything Rosie does, and hello?! She has a sprinkle gift shop!!!!!! #lifegoals I hope you win this gift set and make some adorable cakes and cookies. Those are my Favorite Things of 2015! Cookies and Coffee- sounds about right! After entering my giveaway the COFFEE AND COOKIES GIFT SET below, be sure to head to the other 9 blogs for your chance to win! I was not compensated for this post, however Ninja provided me with a brewer to give away. Also provided: American Serenade coffee, Biscoff cookies, and Sweetapolita’s sprinkle set. 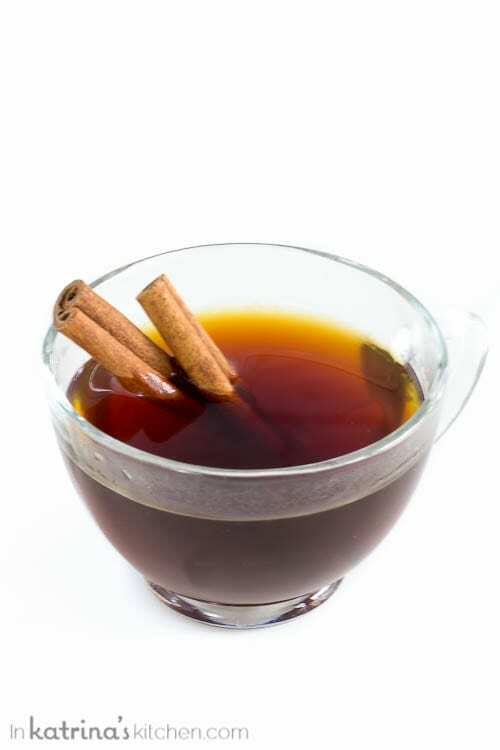 I love coffee, but only if it has so much sugar in it that it basically becomes a dessert! Ahh, those sprinkles are super CUTE!! I am dying to try the ninja coffee bar! I’ve been wanting to try this!!! Fabulous prizes! Thanks food bloggers for sharing your favorite things! Wow!! What an amazing giveaway! Thanks! I’ve been seeing this coffee maker everywhere, and I’d love one! Thanks for the chance! I love coffee with biscoff! I just discovered Biscoff cookie spread this year. It’s so addictive I have to resist eating it straight out of the jar with a spoon! I can’t wait to use it in some holiday baking recipes. As a coffee-lover, I am dying to have that Ninja coffee bar! You have me craving biscoff cookies now!! I’ve been eyeing that Ninja coffee maker since it came out! That would be the perfect addition to my kitchen! Sweet prize. Coffee & cookies, my other half lives for these things. Also Ninja Coffee Bar is the must have holiday gift… if you believe the hype. I have seen the commercials for this and it looks so fun! Happy Holidays! My husband would love to find that coffee machine under the tree…but I would probably keep the cookies as my own little present ;). My husband loves coffee. I love ninja. Perfect! Wow, great list! the ninja coffee maker sounds amazing. Great giveaway too! I would love to have the Ninja coffee brewer, along with everything else! This is one great giveaway!! I am enjoying the hop! Would love to win this – the Ninja is actually on my short list to look at. This would be awesome! As a mom, I give lots of gifts… It would be nice to receive one this year!! I’ve been lusting after this coffee maker since I heard about it. Our keureg is dead and we’ve been missing easy coffee! My kids love Biscoff spread. I would absolutely love, love, love to win this! Being a busy mom and caretaker to others it would surely come in handy! This would totally take care of my coffee addiction! Would love a Ninja Coffee Bar!! 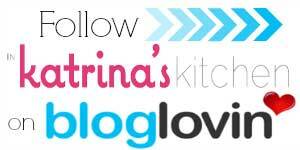 Love your blog…I also have the ninja coffee bar on my wish list. I am a hospice nurse and need my coffee and think it would be a great addition to my home. Also I am from northwest Ohio so I have to say I like my coffee like you do haha! Thanks Hun! I have a ninja blender and I love it ,I have been saving up to buy this coffee maker . If I won, I would give the coffee bar to my son and his fiance as their wedding gift in April 2016. Of course,then I’d have to go buy another for me! Oh man! I’m obsessed with Sweetapolita’s holiday sprinkle set, too! Thanks for the great giveaway! I would love to be able to brew delicious coffee at home. I love coffee and cookies. Thanks! Fun! Such a fun way to start the holidays. The coffee Brewer is awesome! I would love to have this ninja coffee bar! That Ninja Coffee bar is gorgeous! Thanks for this wonderful chance to own it! I would love to have the coffeemaker! Such a fantastic giveaway, thanks for the chance! Great giveaway! I love all of your favorite things. I just discovered your blog recently and am already loving it! Great giveaway! Thanks for the chance 🙂 My husband loves coffee but we don’t own any kind of coffee maker. I love coffee but haven’t hear about the Ninja Coffee Bar. Sounds good! Such a great giveaway! Merry Christmas! I would love to have one of these, I am such a coffee fanatic! What a great giveaway!! Merry Christmas! I bought your Biscoff cookbook when it came out, but I have friends who are obsessed with Biscoff as I am who would love it! This Ninja Coffee Maker looks incredible! That coffee maker looks amazing! Coffee and cookies – my favorites! Would love to have one of these in my kitchen! My whole family would love this! What an awesome giveaway! Me and my mom saw a commercial for the ninja coffee bar. As soon as we saw it we always wanted one. What a great gift it would be if I could win one for my mom. You really know what we want. this is the perfect coffee lovers gift. Fun giveaway! Those biscoff cookies are the best. 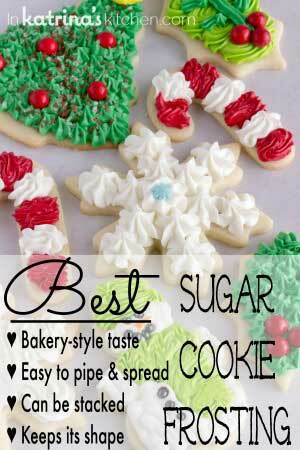 we decorate cookies every year to donate to nursing homes, etc; would love the decorations just for that! The rest of the bundle would be killer, too, I gotta say. Thanks for the possibility of winning. Love this blog! And this giveaway! Thanks, food bloggers!! Thanks for the chance. The coffee maker looks amazing!!! THIS IS A GREAT COMBINATION OF ITEMS. THANK YOU FOR THE CHANCE. BISCOFF COOKIES ARE TO DIE FOR…NEVER SAW SANTA ONES. I love Ninja and I love coffee! And yet I didn’t even know this existed! Thank you for bringing it to my attention! Such a fun collection – I can’t wait to start baking my Christmas cookies so I love the sprinkles and coffee to keep me motivated! Ninja Coffee Bar!! Would love to have all these coffee options! What a wonderful giveaway. Those sprinkles are adorable! Wow what a great giveaway! I love coffee and I love anything ninja. Thanks for the chance to win. My husband still uses a mr. Coffee coffee maker. I got to Starbucks. I think this would solve a few of our problems! Yay! These prizes are outstanding. Anyone would be thrilled to win. You’re cracking me up! She has a sprinkles gift shop…life goals!! Sprinkles make everything better! Love this giveaway! What an awesome giveaway, My boyfriend has been wanting a ninja coffee maker ever since he saw them on tv. Pick me! All of the gifts are lovely! What an awesome giveaway! Thank you!!! I have not heard of this Ninja coffee maker! Oh my gosh!! Def at the top of my list! Biscoff and coffee, that’s all I need. Love it! I have never cooked with Biscoff. I need to try that. I love that Ninja Coffee Maker! That is the coolest coffee pot I’ve ever seen! I would love to get some extra gadgets off my tiny counters to free up space! What awesome faorite things ! Would be would be great to have them ! My daughter and I would love this giveaway. Congrats on the cookbook. Thanks for the giveaway. Merry Christmas! I would love the Ninja Coffee Bar! This is the first time I’ve seen this coffee maker and I”m in love. I really like how it doesn’t produce much waste – which is why I haven’t jumped on the keurig band wagon. Thanks for the chance to enter! 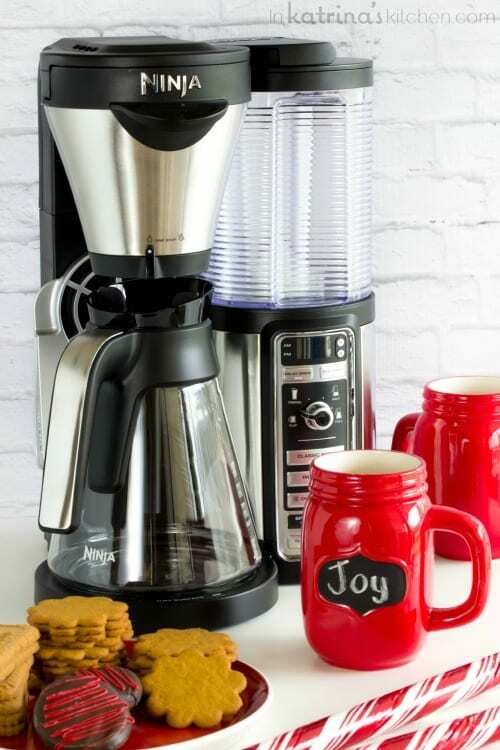 That coffeemaker is going on my wishlist (unless I win it!). 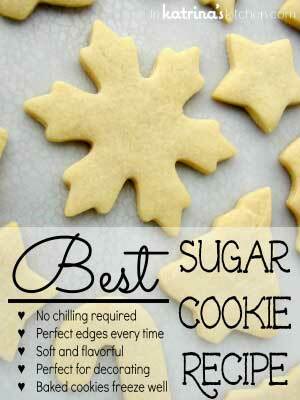 There’s nothing better than baking– especially cookies !! I would love the Ninja coffee machine, I have been eyeing it for awhile! The Santa Biscoff cookies are so cute! I’ve been meaning to try that Biscoff spread for a while now. My daughter would love the Ninja Coffee bar wow! I am drooling over that coffee maker. I would live this! Amazing giveaway..thank you for the chance! 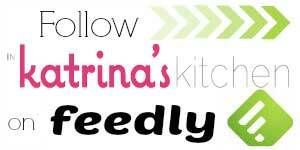 Love this giveaway – so fun! Nothing better than coffee/cookies in the afternoon! Yay for coffee and cookies! What a fun giveaway! Great Giveaway! I am also a Biscoff lover! I’ve been wanting the Ninja Coffee Bar! Awesome giveaway! I ❤️ That ninja coffee bar! I am a coffee lover and this Ninja coffee bar would make my mornings so sweet! This is really neat. Thanks for this great giveaway. This is such a great giveaway. I recently saw this on a commercial and was instantly intrigued 😊. I love this giveaway! Such great stuff. Great giveaway! I hope I win. Love the items in your giveaway prize pack! I’ve been eying those sprinkles from Sweetapolita for some time now! Wow those cookies look so good, thanks for the chance! I’m normally a tea fan, but this coffee maker can do soo much. Ugh, I love ice coffee! My blood type is coffee lol, This would be awesome to win! I have always wanted to try Biscoff cookies and the spread but it doesn’t sell around where I live, what a wonderful prize ty. Love your blog! Giveaway is awesome. The coffee. Maker thing, wow! Those sprinkles? Want them! Thanks so much! OMG, the Ninja coffee bar looks amazing. I know what is on my list to Santa. I NEED that coffee bar! I didn’t know that Biscoff made Santa-shaped cookies! That’s adorable! Congrats on such a spectacular year! Yay!! I hope I win!! As a widower, I would love this Coffee Maker so I could once again have a decent cup of morning coffee. What a great give a way. Coffee and cookies Yum! I would love to have the ninja coffee maker. Love Biscoff cookies!! Anything for a good cup of coffee. Making it at home sweetens the deal. Oh happy days! This would be a dream come true. To have everything in one machine! Thank you for such a nice giveaway. Whoever wins it will be so happy. What a fun collection of favorite things! Thanks for this chance to win them. Happy holidays! Such a great prize package! I really love coffee, so I would really appreciate winning this… Thanks for the giveaway! OMG the coffee ninja! Amazing giveaway!!! What a great giveaway I love the Ninja! Wouldn’t it be great to be able to sit down for a few minutes with a great cup of coffee from the Ninja Coffee Bar, eating some Biscoff cookies and looking thru The Biscoff Cookie and Spread Cookbook. What a terrific prize! I love coffee & need one of these! Would love it try it out! Great blog. Thanks for the chance to win some of your favorite things! Those cookies! haha SO CUTE! 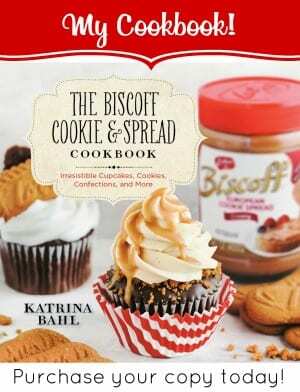 I would love to have the Biscoff Cookie and Spread Cookbook. I could make some cookies and brew myself a cup of coffee in the Ninja Coffee brewer and have such a wonderful morning. Uhm, heavenly! I am so excited for your giveaway. Fingers crossed. wow what a great giveaway!!! The Ninja seems like what I want with both the single cups,etc., and the carafe when we have company. I know whoever wins this will be in 7th heaven. The Ninja Coffee bar looks amazing. The perfect gift every morning! Those sprinkles are so cute. What time is it? Coffee time! Bring it on, Baby! Love to see what kinds of recipes the Biscoff cookbook has. That stuff is amazing!!! I love that Ninja coffee bar. Some really great stuff on your blogs. Wow. All of the yum on this page. Coffee, cookies, sprinkles. What more could you want? I would love to have the Ninja coffee maker. This looks fabulous! My old machine has died:( It would be nice to have a new one. Thanks for chance to win..this looks awesome!!! Looks like great prizes. Mmm, sprinkles! I love that ninja coffee bar! I love everything in your giveaway. It’s the bomb! Great giveaway! Coffee and cookies–awesome! Absolutely Positively would love to win this Ninja coffee bar!! This giveaway is just wonderful! I love the coffee make and the sprinkles. Cookies and coffee make life so much nicer. Thanks for the giveaway! This is such a great prize. Biscoff cookies are amazing!! The sprinkles are so happy! This would go to my husband for Christmas! Thanks! I would love to have the Coffee Ninja Bar. I could quickly become obsessed with the Ninja Coffee Bar as I am a coffee fanatic. FYI – The tweet entry is not working. Thanks for the amazing giveaway. Love all the prizes, especially the sprinkles. Cute sprinkles! And that ninja coffeemaker is amazing! Awesome prize package and I love coffee with Baileys creamers!! Love cookies and the ninja coffee maker would be fabulous to have. I have bee looking at the Ninja Coffee Bar. I would also love to try Bailey’s creamers. I love coffee! What an awesome giveaway!! Thanks for the chance to win. Incredible prize. I sure hope I’m the lucky one. The Ninja has been on the top of my Christmas list. Every time I pass it in the stores I have to stop and stare at it, my boyfriend pulling me away from it. I have a very strong love for making all sorts of coffee drinks. My Christmas would be complete 🙂 Thanks for the chance to win it! I would love to try the Ninja! Thank you so much for the opportunity to win. Been in love with that Ninja coffee bar since the first time I saw the commercial! So good. Oh snap! I must have that ninja! Time to throw out the Keurig! I would absolutely, positively love to win the Ninja Coffee Bar! I <3 coffee & cookies! The coffee bar would make a great Christmas gift. This would be awesome to win!! Thanks for sharing! These are some great Christmas gift ideas! that coffee maker looks awesome! This coffee pot looks awesome!!! Wow what a great giveaway! Been wanting one of these Ninja Coffee since seeing the infomercial. love your giveaway! I want that Ninja Coffee machine. So cool. I would love to win the Ninja! What an awesome giveaway……would love it! Oh my goodness! What an awesome giveaway! Happy Hoildays!! This would be a great gift to receive!!! My mouth is watering and I am feeling giddy just looking at this amazing prize. Thanks! What a great package I can see why these are your favorites! I would love to try the nija coffee bar! Hi Katrina! You are too funny about coffee the color of your NE OH skin! The ninja drinks look so good! Seriously, if I win the Ninja, you’ll hear me cheering from Ohio! That Ninja Coffee Bar looks awsome! I would love to win the ninja coffee maker! A ninja coffee maker?!!! Yay!! That Ninja Coffee maker looks amazing!!! so excited! but hey if I don’t win it…i’ll just come visit you and we can have some coffee! Ahh an entire BOOK full of biscoff cookie recipes?? Sounds amazing! Any time is a good time for cookies and coffee! Awesome ! Everything in the Give-a-way is amazing! Thanks for the entry! Thanks fort his great prize pack. I always need coffee! Coffee is a must every single day! Love those biscoff cookies! MY HUSBAND WOULD REALLY LOVE THIS GREAT PRIZE PACKAGE. Who doesn’t love coffee and cookies! What a great way to entertain over this holiday season. This coffee maker looks amazing and I love Bailey’s creamers. I would love this coffee maker! I like to treat myself to coffee from the coffee shop but would love it even more if I could make it for less at home! Thanks for the giveaway. I’d love to win! Great selection… Coffee lover here! What a fantastic giveaway! I already have the Biscoff book, but it will make a wonderful gift if I win! The Ninja coffee bar looks amazing!! this is such a great giveaway. thank you. I would love to have the Ninja!! This is an amazing giveaway, I have been seeing commercials for the Ninja brewer and would really love to have my own. I have the Ninja Coffee Maker on my list! I love coffee, great giveaway! Thanks so much for this awesome giveaway! ! Would love to win the sprinkles. Coffee gets me through my 12 hour graveyard shifts, bring it on! The Santa Biscoff cookies are adorable and look delicious. We love coffe and treats great giveaway! I love the sprinkles variety pack I could make some fantastic cookies with them. I’m obsessed with the sprinkles!! Thank you for all the great inspiration! The santa cookies are so cute. That coffee machine is a great gift for christmas ! Winning the Nija coffee bar would make my year. Your giveaway is my favorite one of all!! Thank you so much for the chance! Everything looks amazing! I’m so excited cos I LOVE coffee! Thank you for the opportunity! Thank you so much! Merry Christmas and Happy New Year to you and yours :)!!! Oh, this is awesome! What a great giveaway. These really do look amazing and such a great prize. Thanks for the chance. The Ninja coffee maker looks awesome! I love coffee!! this is a great set! Who’d think we would have so much in common! LOL! Seriously, this is a coffee lover’s dream prize! The Ninja coffee bar would make a great gift for my niece. Thanks for the awesome giveaway. Yay! My two favorite things – coffee and cookies! I have had my eye on the Ninja Coffee Bar, I really love coffee. I am usually hesitant to try new coffee machines because my Bunn has been tried and true. A Ninja Coffee Bar would be awesome to win! I am loving all these giveaways and getting some great gift ideas! This is fantastic! I loooove coffee! The coffee maker sounds amazing. What a great prize! It is just what I want to win. This looks awesome. I’d totally gift it to my sister who is need of a new coffee maker, badly! Would love to win that coffee machine for my coffee-obsessed brother & mom! I would REALLY love to win that NINJA! Ever since I saw the commercial for it, I’ve been dying to have one!! It would be my first coffee brewer, and as a college student, it would be greatly appreciated! 😉 …. (and something I can’t afford to buy on my own). What a super duper giveaway, I would love to own that Ninja. I love coffee! This would be so cool to have. Your giveaway is great. I can all ready taste the coffee. Awesome giveaway! I would love to win all of them! Awesome giveaway! I’ve been coveting those sprinkles for a while! Wow, what a great contest! I’m excited!! Thanks for having this giveaway!! Thank you so much for this awesome giveaway!!! I hope you and your family have a Merry Christmas!!! Thank you for the chance to win this giveaway!!! 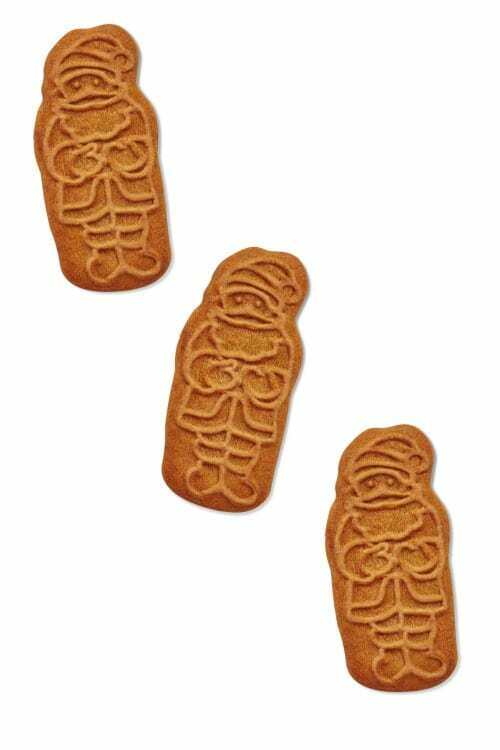 I love Biscoff cookies and the Santas are so cute. As a former northern Ohio gal, I also appreciate great food and drink and sprinkles! That coffee maker is amazing and will be a gift to my daughter should I will! I would Love this ninja!! Everything in this giveaway looks amazing! Would love to win this coffee set. Love the gorgeous red mugs, they really pop. Yay a giveaway, how wonderful! I love the way this giveaway is set up. I am visiting cool, new to me blogs. Super excited! Merry early Christmas! What a fun giveaway!! Live the fancy Brewer! Thanks for the giveaway. The coffee ninja looks fun!! I would love to try the Ninja Coffee Bar. Kitchen gadgets make my list of favorite things too. Also, love the name of your blog! What an awesome giveaway! I especially love those sprinkles. Some great things in the giveaway. I love sprinkles for decorating baked goods! Great items! Those sprinkles are cute!!! My wife would love the coffee bar. what an awesome giveaway. I love the sprinkles. This is the perfect Christmas spirit bundle! Great giveaway! Thanks for the chance to win. That coffee maker looks awesome. We love coffee and sweets love to have this prize! Wow….such awesome products! I’ve never seen those kinds of sprinkles before. Coffee and those cookies sounds wonderful right now. Love this and love coffee! WOW! This giveaway is a coffee lover’s dream. Thanks for the chance! I love coffee and cookies! Awesome giveaway; I really want to try this! Thank you for such a generous giveaway! I LOVE coffee! I LOVE coffee, it’s a treat and for me there’s nothing better!! Thank you so much for this giveaway!! I really enjoyed your site. Found it via Pinterest. Can’t wait to continue reading your blogs. Merry Christmas!